MSE Creative Consulting Blog: "This Was Their Finest Hour"
I've thought of that famous quote from Sir Winston several times since Saturday -- when it became completely clear that Hurricane Sandy was going to be the multi-state disaster that had threatened for the previous two days. While victims and officials are still early in the process of sorting out this huge disaster, it is clear that unprecedented and extremely difficult-to-forecast Hurricane Sandy was meteorology's "finest hour." How good were these forecasts? 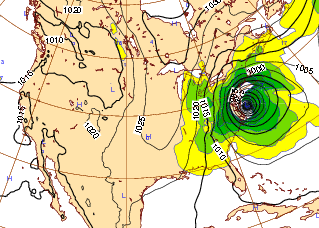 Here is the European computer model's forecast made at 2pm last Wednesday. It shows a hurricane near the coast of New Jersey or DelMarVa yesterday evening. The computer models showed more and more of the details of this ferocious storm as the time grew nearer. The U.S. models didn't do well, at first, taking the storm out to sea. But, human forecasters at AccuWeather and elsewhere put their knowledge and experience to work and leaned on the European heavily to get preliminary warnings and preparatory advice 4.5 days in advance. Those forecasts stayed consistent and got more detailed as time passed. By Saturday, we were predicting the flooding of the subway and two airports in NYC. As of this moment (per both the WSJ and NY Times), the death toll is 33. While every death is a tragedy, that is a tiny sliver of what the numbers would be if Sandy had struck without warning. The surprise Galveston Hurricane killed 8,000. Katrina killed nearly 2,000. The 1938 New England Hurricane (depending on reference) claimed 620 to 800 lives -- and, it was a smaller storm than Sandy. The early warnings gave people time to take the precautions that would allow people to save their lives. Sandy's damage will be in the ten or eleven figures. Huge. Breathtaking. Another blow to the already weak U.S. economy. But that is smaller than it ordinarily would have been. The damage toll, too, will have been mitigated by companies and individuals taking advantage of the early warning. Lowes, for example, used AccuWeather Enterprise Solutions' forecasts to insure their stores in the threatened areas had the supplies they needed to get their customers through the storm. Non-meteorologists are noting the extraordinary quality of these forecasts under meteorologically difficult circumstances. In the days to come, there will be finger pointing and unhappiness over the duration of the power failures and other issues, some genuine, some trivial. But, think about it: Those people will be able to debate, complain, and have dinner with their families because they are alive. Thanks in no small part to the science of meteorology. This was our finest hour. Nice job with the whole storm coverage, Mike and team. Did you mean that damage would run into ten or eleven figures (billions), though? Keep up the fine work. Agreed, fantastic analysis and coverage. Thanks, Mike. I started following your blog just a few days ago. You really helped make sense of what was happening. Yes, absolutely fantastic coverage by the meteorological community!! I first noted the difference between the GFS and Euro eight days in advance. Hi Mike - Congratulations for such an outstanding performance!!! This shows how far the weather community has come in saving lives!